Paleo teriyaki sauce? You may be wondering if it can really be done and, in short, it can. How does one go about recreating a soy based sauce so that all the ingredients are Paleo-approved? The answer to enjoying all of your Japanese inspired dishes is to toss the soy sauce out of the cupboard and switch to coconut aminos instead. Paleo folks often need to take the time to revitalize the dishes of old, the ones with ingredients we no longer eat. Some Asian foods rely heavily on soy sauce (made from fermented soybeans, roasted grains, salty brine and Aspergillus oryzae or Aspergillus sojae molds) to give a deeper color to noodle dishes, to add a hint of sweetness, or as a simple dipping sauce, yet it is off-limits with a Paleo palate. But the flavor is certainly tempting and most of us would do anything for baked chicken wings. Once a bottle of coconut aminos arrives into your life, you will sample it and you will love it, and you will wonder how you ever lived without it. Coconut aminos are made from the aged sap of coconut blossoms. Yum. That is all. Make this gluten-free teriyaki sauce with pineapple juice and spices and soon you will be adding it to your pineapple chicken wraps, seafood or beef dishes. If you want to adventure even further, you can even make teriyaki burgers and grill away! Season the wings to taste with sea salt and freshly ground black pepper. Place in the oven and bake 20 to 25 minutes. Mix the coconut aminos, pineapple juice, honey, ginger, garlic and hot pepper sauce in a saucepan and bring to a light boil over medium-high heat. Mix the tapioca starch with 1 tablespoon of water and pour into the sauce, whisk until the sauce thickens, 8 to 10 minutes. 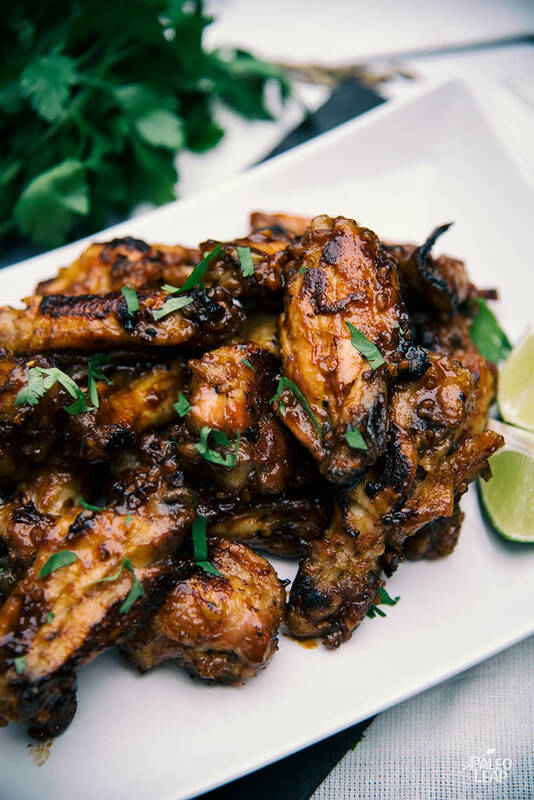 Brush the chicken wings generously with the teriyaki sauce and put back in the oven. Bake another 15 to 20 minutes, basting and turning with the remaining sauce every 5 to 6 minutes.